Welcome to Latin Interactive Entertainment. We organise Salsa, Bachata & Kizomba events in Southampton. 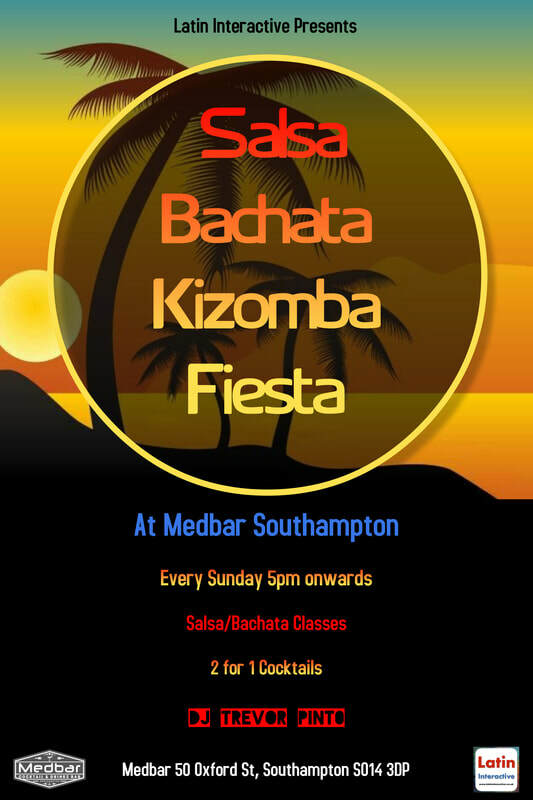 Latin Interactive Entertainment & Medbar presents a Salsa, Bachata & Kizomba Fiesta at Medbar, Southampton every Sunday, in two Rooms from 5pm to 10pm. Class :- We have two Salsa/Bachata Classes every Sunday. - Followed by an Improvers Salsa/Bachata Class from 5.45pm to 6.30pm (You need to have taken at least 5/6 Beginner classes to join the Improvers class) ☀ You do not need to bring a partner along, we all dance together. Fiesta / Freestyle :- We open our Salsa & Bachata Room at 6pm with DJ Trevor Pinto on the decks playing Salsa, Bachata & more till 10pm. And we open our Kizomba Room at 7pm first floor with guest dj Joe Browne on the decks playing Kizomba, Urban Kiz, Semba & more till 11pm. Admission :- £5 for the entire evening. £4 for Students. Please carry your ID. ​Drink Offers :-2-4-1 Cocktails & Mocktails ★ 4 bottled beer £12 ★ Sangria £3.50 ★ Bottle Prosecco £18.95 ★ From 5pm to 8pm. Join us for a Bachata & Salsa Night at Medbar, every second Tuesday. We will be playing 50% Bachata and 50% Salsa. ➤ CLASS : - We have a Beginners Bachata class from 8pm to 9pm. You do not need to bring a partner along, we all dance together. Everyone is welcome. ➤ PARTY : - We have dj Trevor Pinto playing Bachata, Salsa & more 9pm onwards. ➤ LATIN PARTY :- DJ Panj will be playing Latin Hits, Reggaeton and more 12am onwards. ➤ ADMISSION :- £4 / £3 for students. Please carry your ID. ➤ MORE INFO :- Please call Medbar on 02380 231555 ☀Please note photographs and video is taken at all our events for publicity. This event will be held on the ground floor. Please share this event and invite your friends. Thank you. Follow us on FACEBOOK and INSTAGRAM. Salsa & Bachata Fiesta at Slug & Lettuce Winchester every Wednesday. Learn a new life skill. Make new friends. Learn to dance Salsa & Bachata in a fun environment. We will be teaching a Beginners and a Intermediate Salsa/Bachata class every Wednesday, (we would be alternating between Salsa & Bachata every Wednesday) this would be followed by a Party/Freestyle, where you can practice the moves you learnt in the class. CLASS :- We have two Salsa/Bachata Classes every Wednesday. A Beginners Salsa/Bachata Class from 7.30pm to 8.15pm. Followed by an Improvers Salsa/Bachata Class from 8.15pm to 9pm (You need to have taken at least 5/6 Beginner classes to join the Improvers class) ☀ You do not need to bring a partner along, we all dance together. PARTY/FREESTYLE :- We have dj Trevor Pinto playing Salsa & Bachata 9pm onwards for you to practice your moves. ADMISSION :- £5 / £4 for students. Students please carry your ID. DRINK OFFERS :- 2-4-1 Cocktails and Mocktails. 2 Bombs for £6. Please see menu for more offers. PARKING :- The closest car park is Tower Street Car Park, Tower St, Winchester SO23 8TA. Parking is free 6pm onwards. FAQ :- Q. What style of Salsa will you be teaching ? Q. What style of Bachata will you be teaching ? A. We will be teaching Sensual Bachata. More about Bachata. MORE INFO :- If you have any more questions please send us a message via fb or email we will try and get back to you ASAP. Please note photographs and video is taken at all our events. Join for a Salsa & Bachata Fiesta at Medbar Hythe every Thursday 7.30pm onwards. Learn a new life skill. Make new friends. Learn to dance Salsa & Bachata in a fun environment. We will be teaching a Beginners and a Improvers Salsa or Bachata class every Thursday, (we would be alternating between Salsa & Bachata every Thursday) this would be followed by a Fiesta/Freestyle, where you can practice the moves you learnt in the class. ➤ CLASSES :- We have two SALSA Classes. - Followed by an Improvers SALSA Class from 8.15pm to 9pm. You do not need to bring a partner along, we all dance together. ➤ FIESTA/FREESTYLE :- We have DJ Trevor Pinto playing Salsa, Bachata & more from 9pm to 11pm and from 11pm to midnight he will be playing Reggaeton, Merengue, Latin Hits and more..
➤ ADMISSION :- £5 for the entire evening. ➤ FAQ : - What style of Salsa will you be teaching ?? We will be teaching LA Style Salsa/Salsa On1 /CrossBody Salsa. More about Salsa . What style of Bachata will you be teaching ?? We will be teaching Sensual Bachata. More about Bachata . ➤ MORE INFO ​:- Please note photographs and video is taken at all our events for publicity.